But since dinner is coming up soon and I’m getting ready to pause in the work anyway, I wanted to take a moment to share my day’s writing reminder. Yesterday, for people following along, I got the reminder that sometimes writing time doesn’t go according to plan, and that’s okay because the writing will always be there waiting. Today, I harkened back to an early problem I had with the Hagridden draft: STOP RESEARCHING! I seriously blew two whole hours today checking maps and topography, reading about 19th century shotguns and the rank designations in cavalry units, watching videos of people firing muzzle-loading rifles and shooting bowling balls out of homemade cannons . . . which is when I realized I’d fallen into the Pit of Research (I had nearly two-dozen tabs open in my browser!) and hadn’t done any writing in hours. 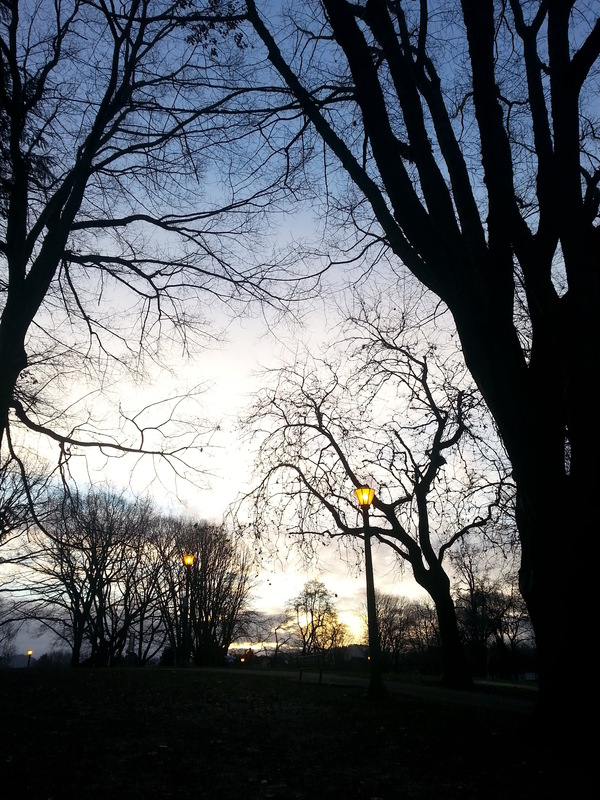 This is my park — I took this during my walk this afternoon, just before the sun set. This was a common problem when I was drafting Hagridden, too, though because my resources then were a bit scarcer, I was more easily able to stay on track. Today, I actually had to leave the house and go for a walk through our big neighborhood park to clear my head and get unstuck from the mire of the Internet. And it worked, because on that walk, I was able to mentally figure out all the rest of this chapter I’ve been working on, and I deepened some of the purpose motivating my characters, and I generally just rebooted and got myself back into writing mode. Back in my study, I worked through a couple more pages and now I’m in the right place to carry me through the night. So, daily writing tip: turn off the wifi, and, if necessary, talk a long walk in cool near-winter air. The Internet can be awfully friendly to a writer, but it’s like a boozy friend who drinks too much and forgets boundaries. Sometimes it gets too friendly, and that’s when you need to get some distance.